Advertiser.ie - Could you live without plastic for a week? Some of the many participants for Galway No Plastic Week. High profile Galwegians are tackling the challenge of living ‘plastic free’ for the week commencing February 5 as part of Plastic Free Week in Galway City. Participants include Mayor of Galway City Pearce Flannery; Jake Heenan, Flanker for Connacht Rugby; JP McMahon, of Michelin-star restaurant Aniar; Hannah Kiely, Chief Executive of Galway2020; Dr Peter Heffernan, Chief Executive of the Marine Institute; and a number of well-known faces from the cast of Ros na Rún, among others. 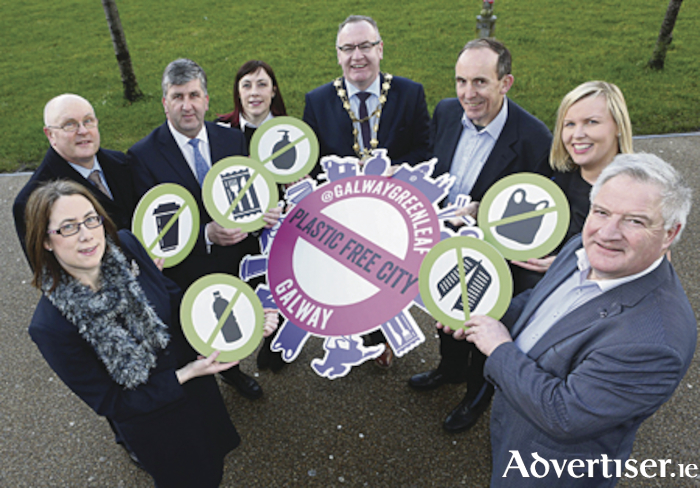 NUI Galway, Galway Mayo Institute of Technology and schools across the city will also participate in the initiative, which aims to reduce the use of single-use, disposable plastic products, through action, education and example. Easy tips to reduce plastic include switching to reusable bags, takeaway cups and water bottles; carrying a ‘spork’ instead of using disposable cutlery; and ditching plastic straws. Speaking about the initiative, Mayor Pearce Flannery said, “Plastic is a very flexible and useful material that plays many important roles in our lives. However plastic is causing unprecedented environmental problems due the sheer volumes we use, some of which is unnecessary. Arlene Finn, European Green Leaf coordinator for Galway City Council said that over the past 60-70 years, plastic has changed everything from clothing, cooking and catering, to product design, engineering and retailing. “Nearly all the plastic ever created still exists in some form today, and half the plastic we use is used just once, and thrown away. Plastic can take up to 500 years to decompose, and it can cause unsightly litter on our streets. Schools, businesses and other organisations are invited to participate in the week, by encouraging their community to reduce their plastic use, and by sharing their experiences using the tags #plasticfreeforaweek #plasticfreegalway and @galwaygreenleaf. The Plastic Free Week poster is available from Galway City Council, contact 091 536 400. Also participating in Plastic Free Week are Mayor Anna Tenje, of Vaxjo, Sweden, and Mayor Carlos Manuel Antunes Bernardes, Torres Vedras, Portugal. Torres Vedras was the first European Green Leaf city in 2015, and Vaxjo are the 2018 European Green Leaf city.